A second batch of emails obtained illegally from the inbox of John Podesta, Hillary Clinton's campaign chair, offered fresh insight Monday into her team's handling of the biggest liabilities facing her campaign. The 2,086 emails, released Monday by WikiLeaks, brought the total number of records published through the hack to more than 4,000. Emails posted Friday by the same site contained 77 pages of excerpts from Clinton's most controversial paid speeches. Clinton dodged a question Sunday evening about the inconsistencies in her political positions that were revealed late last week when WikiLeaks published its first trove of Podesta emails. During the second presidential debate, Clinton focused mainly on the alleged hackers who infiltrated Podesta's inbox, rather than the contents of the emails within it. "Our intelligence community just came out and said, in the last few days that the Kremlin ... are directing the attacks, the hacking, on American accounts to influence our election," she said. "The Russians hack information, we don't even know if it's accurate," Clinton added. "Believe me, they're not doing it to get me elected." WikiLeaks claims to have taken as many as 50,000 emails from Podesta's inbox, dating back to the 2008 campaign. The insight provided by his emails was largely eclipsed by the firestorm of criticism that followed the release, just hours earlier, of footage capturing lewd comments Donald Trump made to an NBC host in 2005. Here are 14 revelations contained in the Podesta emails. Clinton told an audience at a luncheon for the Jewish United Fund Of Metropolitan Chicago Vanguard in Oct. 2013 that the flow of Syrian refugees into Jordan had put that country's security at risk. "There's a discussion going on now across the region to try to see where there might be common ground to deal with the threat posed by extremism," Clinton said, according to paid speech transcripts included among Podesta's emails. "And particularly with Syria which has everyone quite worried, Jordan because it's on their border and they have hundreds of thousands of refugees and they can't possibly vet all those refugees so they don't know if, you know, jihadists are coming in along with legitimate refugees," she said. Clinton has called on the U.S. to accept 65,000 Syrian refugees, a dramatic increase from President Obama's proposal of 10,000. While critics of the administration's refugee policy have pointed to inadequacies in the vetting process, Clinton has staked her position on the assumption that U.S. officials have the resources to screen incoming Syrian refugees effectively. Emails suggest Clinton's closest aides were concerned about facing Republican Sen. Marco Rubio in the general election, fearing he could pose the greatest threat to her White House ambitions. "He gives a good speech, and sounded much more reasonable, populist and accessible than much of the rest of the GOP field. Felt more like an inspiring Democratic speech than a GOP candidate," wrote a communications aide in April 2015. A conversation from July of that year shows senior members of Clinton's team agonized over what to tweet at Rubio in response to his criticism of the administration's moves in Cuba. In May 2015, Clinton's campaign staff dialed back a proposed attack on Iowa Rep. Steve King's hardline immigration proposals in order to draw a sharper contrast with Rubio and Jeb Bush. "[T]he question... is whether hitting King takes away from our effort to get a clean contrast with Bush/Rubio et al. They would also attack King, so it sort of lets them off the hook," Sullivan wrote to a group of campaign aides as they ironed out wrinkles in an upcoming immigration speech. In Oct. 2015, Podesta and other campaign aides discussed ways to use Rubio's absence from the Senate as an attack line against him. An email sent from a liberal columnist to a Clinton ally in March 2015revealed fears among her supporters that Clinton was "almost totally dependent on Republicans nominating Trump," suggesting any of the other GOP primary contenders, including Rubio, could have defeated her in a general election. Donna Brazile, acting head of the Democratic National Committee,tipped off the Clinton campaign to Sen. Bernie Sanders' plans to launch an education-themed "Twitterstorm" run by his African-American outreach team in January. Brazile was then vice chair at the DNC. Adrienne Elrod, a Clinton campaign spokesman, thanked Brazile for the "heads up." Brazile ascended to her present position when her predecessor, Rep. Debbie Wasserman Schultz, was felled by her underhanded attempts to boost Clinton over Sanders. Those efforts were revealed in July through a separate tranche of WikiLeaks documents taken from the DNC. Transcripts show Clinton spoke frequently and affectionately of her family's foundation and some of its largest donors, such as Bank of America and Gap, Inc.
Emails show Clinton's staff struggled on how to handle her past support of the Keystone Pipeline, which came under review at the State Department while she was secretary of state. For example, one exchange from April 2014 showed Podesta advised writers to remove a passage expressing optimism about the Keystone Pipeline project from Clinton's book, "Hard Choices," which was then heading for production. "The Secretary is open to cutting and thinks maybe we'll add a few more lines on the promise of clean energy instead," wrote Dan Schwerin, Clinton's speechwriter, in response. Robby Mook, Clinton's campaign manager, worried that reports linking payments from Keystone-backing firms to Clinton's husband would draw the ire of "enviros" in April 2015. "Have we discussed when she will come out against Keystone? After POTUS vetoes?" Mook asked Jake Sullivan, a senior campaign adviser. Clinton announced her opposition to the Keystone Pipeline in Sept. 2015. Shortly after she did so, Brian Fallon, a campaign spokesman, referredto her stance as a "newfound position on Keystone." Fallon voiced concerns that publishing an op-ed about Clinton's opposition to the Keystone project could create the "perception that she is putting a finger to the wind." In Aug. 2015, Mook suggested unveiling Clinton's stance on Keystone as a way to change the conversation away from her email scandal. "We could even have her come out against Keystone...which will solicit criticism but that might help distract from emails," Mook wrote to a group of high-level campaign staffers. Emails suggested Clinton's staff discussed ways to divert attentionfrom the controversy brewing over the former secretary of state's use of a private email server. In one exchange from March 2015, for example, Podesta advised his fellow campaign hands that "we want the fight to be about Benghazi, not about servers in her basement." In another, her campaign team considered making light of the burgeoning scandal through jokes at an EMILY'S List dinner before scrapping the idea out of fear that the controversy could grow. "We don't know what's in the emails, so we are nervous about this," wrote Mandy Grunwald, a longtime Clinton adviser. "Might get a big laugh tonight and regret it when content of emails is disclosed." Clinton's campaign chair, a former White House counselor to President Obama, pushed Obama campaign hands to consider a top climate activist and ... for the position of energy secretary. Podesta nixed a suggestion to place Jeffrey Immelt, the CEO of General Electric, in that position, arguing that the appointment of Immelt "seems impossible to me." The Obama alum floated the possibility of naming former California Gov. Arnold Schwarzenegger to that position. Steyer is the single biggest donor in the entire 2016 cycle to date, giving the entirety of his $39 million in contributions to Democrats, according to the Center for Responsive Politics. Attacked constantly during the primary for her acceptance of large donations from big banks, Clinton was repeatedly forced to assert her commitment to cracking down on Wall Street. Speech excerpts hint at Clinton's affection for financial institutions, however. In speeches to various special interests, Clinton defended the actions of Wall Street in the wake of the financial crisis and praised the work of big banks toward growing the economy. "[M]any of you in this room are masters of the trend lines. You see over the horizon, you think about products that nobody has invented, and you go about the business of trying to do that," Clinton told an audience at Goldman Sachs in Oct. 2013. A discussion among high-level campaign aides in Oct. 2015 suggested Clinton's team considered reversing her position on Glass-Steagall, a key financial regulation, based on a desire to prevent Sen. Elizabeth Warren from backing Sanders. Campaign hands described the choice as a "political decision." During a primary debate in March against Sanders, Clinton said she would impose such strict environmental regulations on fracking that most fracking operations would be required to shut down. "By the time we get through all of my conditions, I do not think there will be many places in America where fracking will continue to take place. And I think that's the best approach, because right now, there are places where fracking is going on that are not sufficiently regulated," Clinton said at the debate. But excerpts from a speech to Deutsche Bank in April 2013 show Clinton had expressed support for fracking in spite of the environmental consequences. "There will always be some environmental cost in extracting hydrocarbons, rare earth minerals, you name it from both the earth and the oceans," Clinton said in the speech. "I mean, the whole idea of how fracking came to be available in the marketplace is because of research done by our government. And I've promoted fracking in other places around the world." Cheryl Mills, a board member at the Clinton Foundation, arranged for Clinton campaign staff to meet with a top Facebook executive in Feb. 2015 to obtain "gender research." Sheryl Sandberg, chief operating officer at Facebook, agreed to attend an "HRC meeting" in early March along with her unnamed researcher in order to share data on "gender and leadership by women," emails show. Excerpts of paid speeches that her campaign had flagged as potential liabilities showed Clinton said in May 2013 that she supported "open trade and open borders," two policies she has explicitly denied during her presidential campaign. "My dream is a hemispheric common market, with open trade and open borders, some time in the future with energy that is as green and sustainable as we can get it, powering growth and opportunity for every person in the hemisphere," Clinton said in a speech bought by Banco Itau, an Italian bank. She pocketed $225,000 for the Banco Itau speech. The passage could raise questions for Clinton because progressives were already skeptical of her commitment to blocking multinational trade deals like the Trans Pacific Partnership. Although she called it the "gold standard" of trade agreements while secretary of state, she disavowed the deal after it was finalized during the Democratic primary. Supporters of her opponent, Sen. Bernie Sanders, accused Clinton of flip-flopping on trade. Sen. Tim Kaine, Clinton's running mate, pushed back on the suggestion that the Democratic nominee's plan included support for open borders during the vice presidential debate last week. He instead argued Clinton had pushed "to do more border control." In April 2013, Clinton said lawmakers should conceal the policy-making process from voters because the backroom deals it entails could make them "nervous." "If everybody's watching, you know, all of the back room discussions and the deals, you know, then people get a little nervous, to say the least. So, you need both a public and a private position," Clinton said during a speech to the National Multi-Housing Council, for which she earned $225,000. Her comments could prove problematic given that Clinton's greatest weakness is her inability to gain the trust of many voters in her own party. Beyond the controversies that have plagued her campaign, Clinton has suffered from the charge that she adopted progressive positions in order to overcome Sanders' populist appeal in a tougher-than-expected primary. Emails showed Chelsea Clinton was worried about a consulting firm that was founded by former aides to Bil Clinton, prompting clashes within the Clinton Foundation as staff fretted about the blurred lines between Clinton endeavors. Teneo Strategies, co-founded by former Bill Clinton aide Doug Band, created potential conflicts of interest when Huma Abedin and Band went to State Department officials to seek assistance for Teneo's clients. Abedin was employed at the State Department, the Clinton Foundation and Teneo simulateneously during the final months of Hillary Clinton's tenure as secretary of state. In a Nov. 2011 email to Podesta, Band worried that "if this story gets out, we are screwed." He was referring to Chelsea Clinton's assertions that Teneo employees had begun to invoke Bill Clinton's name, without his knowledge or consent, on behalf of corporate clients. "She is acting like a spoiled brat kid who has nothing else to do but create issues to justify what she's doing because she, as she has said, hasn't found her way and has a lack of focus in her life," Band said of the former first daughter's criticisms. Band later described an incident in which the Clinton Foundation's chief operating officer, Laura Graham, contemplated suicide in Dec. 2011 due to the "stress" of the "office crap" that transpired at the foundation. "But I'm sure [C]helsea is more concerned with a mostly false story in the distinguished ny post [sic] about mf global [sic] and [T]eneo not her role in what happened to laura/bruce [sic], what she is doing to the organization or the several of stories that have appeared in the ny post about her father and a multitude of women over the years," Band wrote. He was referring to Graham and Bruce Lindsey, chairman of the Clinton Foundation's board. MF Global's collapse after hiring Teneo as a well-paid consultantcaused a minor controversy in 2011 for Bill Clinton, who was then on Teneo's board. He stepped down in 2012.
by ANDREW MCCARTHY October 11, 2016 5:57 PM Publishing stolen private e-mails is wrong, but if those e-mails are authentic, we must take them seriously. Journalists are poring over the hacked trove of John Podesta’s e-mails published by WikiLeaks. Some of the e-mails, which I’ll be discussing in subsequent posts, are damaging to Hillary Clinton, so it is no surprise that Donald Trump and his surrogates are drawing attention to them. I think this is appropriate, for reasons I’ll get to in a second. But we should still give some preliminary consideration to the source, and to the degree, if any, that questions about the manner in which the documents were procured diminish their reliability. Understandably, the Clinton camp has stressed the questionable nature of WikiLeaks’s operations. That is what lawyers tend to do when documents show up that cast their clients (and themselves) in an unflattering light. There is some persuasive force to these complaints. They are too convenient, though. When it came to top-secret information stolen and leaked by Edward Snowden, the reaction on the left and among many libertarians was that the documents appeared authentic and thus it was proper — essential, in fact — to base reporting and arguments on them. Concerns that what Snowden had done was illegal and treasonous, and that the leaks immensely damaged national security, were said to be trivial compared to the imperative of exposing supposedly monstrous government surveillance activities. Many to this day regard Snowden as a hero. As I am often constrained to observe, our progressive politics today are not about right and wrong but about us and them — logic is out, “narrative” is in. So we shouldn’t go looking for the Left to take consistent positions. If theft and leaks help The Cause, what matters is the substance of the documents; if they hurt, then it’s time to start worrying about authenticity, moral hazard, etc. But let’s try to sort out right and wrong, even if the answers are unsatisfying. The basic rule applied in American courts is that even an atrocious source can produce authentic, reliable evidence. The more atrocious the source, though, the higher the burden to establish authenticity and reliability (there are salient differences between the latter two things, which we’ll get to presently). This is easier to grasp with documents than testimony: It can be very hard (often impossible) to establish the trustworthiness of testimony from a dubious source, while the authenticity of a document can often be verified pretty easily. If, upon examination, the document appears to be what it is represented to be, and especially if its authenticity is not refuted by those with a reason to refute it, it is generally admitted into evidence for the jury’s consideration. But how much the jury should rely on the document’s contents (the “weight” to be given them) depends on how much reason there is to suspect the document is fraudulent or misleadingly incomplete. In the present case, WikiLeaks has a history of releasing information that — whatever you may think about how it was acquired — proves authentic and often reliable. We know that because, to my knowledge, no one has proved any of their documents fraudulent despite having great incentive and opportunity to do so. People and agencies whose documents have been leaked have, in arguing over them, conceded (usually tacitly) that they are what WikiLeaks purports them to be. For example, when Snowden leaked information showing that U.S. intelligence agencies were monitoring German chancellor Angela Merkel’s cellphone, President Obama reportedly apologized — he didn’t tell Merkel not to believe everything she reads in the papers. By contrast, the so-called Rathergate controversy, involving documents manufactured to discredit President George W. Bush, reminded us that people with access to rudimentary testing methods and to source information can discredit bogus documents pretty quickly. WikiLeaks has a history of releasing information that — whatever you may think about how it was acquired — proves authentic and often reliable. In the case of Podesta’s e-mails, he and his correspondents obviously know whether the exchanges really happened, and whether the documents WikiLeaks has published are true copies of the exchanges. Moreover, if the documents were fakes, it would be a real coup for Podesta, Clinton, et al. to be able to show that this is the case. But they have resisted making a fraud claim, asserting they are too busy to examine the documents for accuracy. Their response seems limited to sweeping attacks on the source and minimization of the substance. Therefore, I believe we can safely assume that the e-mails are the real thing. We can also safely assume that the Clinton campaign, of which Podesta is the manager, is banking on the cooperation of its media friends to downplay revelations in the e-mails and emphasize questions about the source — a very safe bet in light of what the e-mails confirm about the coziness of Clinton-media relations. SHARE ARTICLE ON FACEBOOKSHARE TWEET ARTICLETWEETThat is not the end of the matter. John Schindler, a real expert in intelligence analysis and counterintelligence, credibly suspects that WikiLeaks is a front for Russian intelligence. Our earlier reference to l’affaire Snowden is very relevant here: As Schindler recounts, it was WikiLeaks founder Julian Assange, a key Snowden supporter, who persuaded the self-styled civil-liberties crusader to take refuge in Putin’s repressive thugocracy. This gets us to the distinction between authenticity and reliability. Whether we think Assange is an agent of Putin, or an independent actor somehow allied with Putin, the fact remains that WikiLeaks has an anti-American agenda. An actor with an agenda can release authentic information, but it is unlikely to be complete information — the agenda will control which documents are leaked and which are withheld, allowing reality to be spun rather than unveiled. In this instance, even if the e-mails disseminated are real, there may be e-mails and other information that WikiLeaks is not disclosing that could put what has been disclosed in a fuller context — one that might be more favorable to Mrs. Clinton and her allies. If there is information WikiLeaks has withheld that would make things look better for the Clinton camp, the Clinton camp has it. Yet, this is unlikely. For example, when it comes to Mrs. Clinton’s speeches to wealthy donors, she either made the statements quoted or she didn’t. If entire speeches have been published, it is hard to make the case that something has been withheld that would put her statements in a more flattering light, especially after she adamantly refused to release transcripts despite badgering from the Bernie Sanders campaign (though, of course, not much badgering from the media). And if Clinton operatives were having lovey-dovey communications with their pals in the press, or Clinton State Department officials were seamlessly colluding with Clinton Foundation officials and other Clinton kitchen-cabinet members, those are exchanges that should not have happened as they did; if the e-mails are authentic, it is improbable that other, undisclosed e-mails would make us think better of them. Nevertheless, if there is information WikiLeaks has withheld that would make things look better for the Clinton camp, the Clinton camp has it. They have the ability to complete the picture. But I’m not holding my breath. All of that being said, even assuming that the documents released are authentic and reliable, their disclosure by WikiLeaks was wrong. By relying on them as a source, we are encouraging more rogue behavior, consciously or not. That doesn’t necessarily mean we should not rely on them. It is a longstanding doctrine of law, for example, that the Fourth Amendment gives you no protection if a private person (rather than a government agent) invades your privacy or steals your private papers. The contents of such a theft are admissible evidence in court, even though they would be suppressed if police had unconstitutionally seized them, because we generally prize access to relevant, accurate information over concerns about the way the information was uncovered. That doesn’t make it right. Nor does it mean that we should turn a blind eye to the fact that hostile forces are interfering in our elections or our national security. I don’t know what more can be done about this besides prosecuting hackers and spies when the opportunity presents itself, without regard to partisan advantage. But as for partisan considerations, I don’t believe in unilateral disarmament: If WikiLeaks got hold of and published additional recordings of Donald Trump besotting himself, is there any doubt that the Clinton camp and the media would be gleefully exploiting them? If information is authentic, it has to be fair game, because one has no expectation that scruples will give the adversary pause. MORE WIKILEAKS HILLARY’S OCTOBER SURPRISE: WIKILEAKS RELEASES CAMP CLINTON E-MAILS KRAUTHAMMER’S TAKE: TRUMP & CLINTON LEAKS ‘INCREASE THE NEGATIVES ON BOTH OF THEM’ THE WIKILEAKS BUST WAS CONSERVATIVE SCANDAL OBSESSION IN A MICROCOSM Thus, a final thought: Our protection is encryption. Earlier this year, Apple was decried for fighting the FBI’s campaign to force it to break the code blocking access to a terrorist’s iPhone. As I countered at the time, Apple’s real and quite legitimate concern was the government’s broader effort to control encryption technology, such that its evolution never outpaced the government’s ability to pierce it. While the government was conditioning us to think of encryption solely as camouflage for criminals and terrorists, the exchanges of malevolent actors represent a negligible fraction of all world communications. In the information age, encryption is vital to the protection of our e-mails, financial records, intelligence databases, strategic military planning – everything. It is not possible to give government a back door through encryption without giving the same back door to the likes of WikiLeaks operatives and Putin’s intelligence services. As a practical matter, we cannot and should not prevent people from relying on available, authentic information to make their points in a political debate. But we ought to be making it harder for rogues to steal and publish private information — even if that means it is lost to election campaigns and high-stakes public debates. — Andrew C. McCarthy is a senior policy fellow at the National Review Institute and a contributing editor of National Review. I know she has begun to hate everyday Americans, but I think we should use it once the first time she says I’m running for president because you and everyday Americans need a champion. I think if she doesn’t say it once, people will notice and say we false started in Iowa. Jennifer Palmieri, Director of Communications for Clinton’s presidential campaign, agreed with Podesta’s assessment, with the word “Truth” in response, according to WikiLeaks. It’s interesting that Clinton said that about a year before her email scandal blew up — something that reignited the anger of many Americans over the fact that the Clintons get to play by a wildly different set of rules than the rest of us. If anyone still wasn’t convinced of the hatred Clinton has for most Americans, this should do it. Moreover, if anyone doesn’t get it after this, it’s likely that they never will. Clinton sees voters as a means to an end. She, like many liberals — and globalist elites in general — believe that they know better than the unwashed masses what direction the country should go in and that we should just shut up and get in line. There was already enough out there about Clinton to make this call, but particularly after this release, how can anyone honestly say that Clinton is a better option than Republican nominee Donald Trump? Clinton has proven that she not only has disdain for everything this country stands for, she bears a distinct hatred for the people of this great nation — and particularly those that don’t want any part of her radical agenda. Don’t worry about it, Hillary, many of us feel the same way about you — and if Trump is elected, perhaps you can spend some quality time stewing about it in a prison cell. If you get most of your news from the old media establishment consisting of newspapers and TV network news, you’d be forgiven for not knowing about the damaging information contained in the latest batch of hacked emails publicly released by the whistleblower site WikiLeaks. That would be because the old media is systematically ignoring the story. Why? Because what is contained in these emails is thoroughly damaging to the Democrat Party as well as to Hillary Clinton and her campaign. As news about a decade-old recording of Donald Trump’s locker room banter continues to take the lion’s share of the old media’s attention, others have been digesting the 2 thousand emails from Hillary’s top campaign aide John Podesta. And what these emails say about the collusion of the media with team Hillary, the backroom vendetta Democrats had for Democrat candidate Bernie Sanders, the general hatred that Democrats have for the American people, and Team Hillary’s criminal actions is truly illuminating. This particular batch of emails are hacked messages sent to and from Clinton campaign Chairman John Podesta. He is a long-term associate of the Clintons and was President Bill Clinton’s Chief of Staff from 1998 until 2001. Podesta also owns the Podesta Group, a major lobbying firm, and is the Chair of the Center for American Progress (CAP), a far left-wing Washington DC-based think tank. Some of the most disgusting, if unsurprising, revelations in the email dump is the bald collusion between Democrat Party operatives and the sold out media. Disgusting for its bias, yet unsurprising for the fact that at this point that bias seems to be a given. One email, for instance, shows The New York Times reporter and CNBC anchor John Harwood writing Podesta to offer tips on how Hillary can destroy other candidates for president and bragging that he attacked Donald Trump when he was a “moderator” at one of the primary season debates. Despite his status as a “journalist,” Harwood clearly saw his job as “moderator” of the debate as one of destroying Republicans in an effort to aid Hillary’s campaign for president. In another email, The New York Times’ Nicholas Kristoff is seen corresponding with Podesta to supply Bill Clinton with all the questions he planned to ask during an upcoming interview giving Team Hillary all the time it needed to come up with “spontaneous” replies he could dutifully “report” as fact. These are just two of many, but in a side note it is interesting to hear far left-wing “reporter” Gwen Ifill claiming that if the media were not all wee-weed up (as the President might say) about the 10-year-old Trump locker room tape they would be forced to report about these damning WikiLeaks revelations. Of course, the Trump tape is not in any way more important than the WikiLeaks release. But the media would much rather ignore the more important story because it makes Hillary and Democrats look bad. And looking bad, indeed. Other emails seem to prove that the Obama State Department worked directly with Hillary’s campaign while responding to a Freedom of Information Act request to release Hillary’s emails when she was Obama’s Secretary of State. This is notable because Hillary should have had nothing at all to do with the State Dept’s release of the emails as she had already resigned from her office, was no longer in the employ of the federal government, and had already launched her campaign for president. Despite all that, here was Obama’s State Department coordinating the release of official government documents with a mere candidate for president who should have had no role at all in such efforts. But clearly Obama’s administration was trying to give Hillary a heads up about what was being released so she could mount a defense or destroy other emails that may be connected to those being released. Another part of the Podesta email dump also contained an 80-page document with excerpts of some of the many speeches Hillary gave to various banks, investment groups, and corporations, speeches she has adamantly refused to make public. This document sort of shows why she wanted to keep these speeches under wraps because some of the things she said during these appearances is shocking, to say the least. In one such segment Hillary shared classified information about the Obama admin’s efforts against terrorism. During a 2013 speech to a ­Toronto business organization she divulged classified details about Obama’s hunt for Osama bin Laden in 2011. This was an illegal disclosure and alone should have sent her to jail… like it would anyone else. Speaking of others being jailed for what Hillary has done, I must bring to your attention the recent case of Harold Martin. Mr. Martin was arrested for having classified information in his car and home. The FBI insisted that Martin broke our national security laws despite there being no proof he intended to sell the information or give it to the nation’s enemies. But this is exactly the reverse of the standard the corrupt FBI applied to Hillary. She had classified information in her home but FBI director Comey decided that since Hillary didn’t “intend” to do anything bad with the info, then she was obviously innocent. Why the double standard? I know YOU can answer that. Speaking of illegal activity, the email dump also seems to show John Podesta’s efforts tocommit voter fraud in Colorado. The email in question reveals Podesta himself relating the story of having met two people in Colorado who admitted to flooding the polls with ineligible voters in order to make sure Hillary beat Senator Bernie Sanders during the Democrat primary. As we come to mentioning Bernie Sanders, there is much to show just how unfair the Democrat Party was to the erstwhile socialist Senator from Vermont and Democrat candidate for President. The WikiLeaks releases shows that the coordination between Team Hillary and the Democrat National Committee did not stop after DNC Chairperson Debbie Wasserman Schultz was kicked out of her chairmanship for working behind the scenes to destroy Bernie Sanders despite her official role as facilitator of all Democrat candidates. The email dump shows that new DNC head Donna Brazile was also up to her armpits in the effort to torpedo Sanders in favor of Hillary. This same adviser went on to insist that both Bernie Sanders and Donald Trump are employing the sort of “Nazi tactics” pioneered by Nazi propagandist Joseph Goebels. Another missive revealed that Clinton daughter Chelsea was heartlessly more concernedwith public relations than in helping a Clinton Foundation employee that was reportedly on the verge of suicide. That wasn’t the only time Chelsea Clinton was mentioned in the email leak. In another she was called a “spoiled brat” by Clinton operative Doug Band. Finally, of these emails I’ll mention here, in an email written by Hillary herself to Podesta, the Democrat candidate for president revealed that the governments of Qatar and Saudi Arabia are directly funding ISIS. And yet, Hillary and her pseudo charity have taken tens of millions from these very nations. There are far more damaging emails like those above, but at a hefty 2,000 emails — and those are just the first batch, apparently — are far too many and varied for me to get into all them here. You can see a growing compilation at Breitbart News if you are interested. But suffice to say, these emails are far more consequential and important than a 10-year-old audio tape of Donald Trump’s locker room talk about a woman. Naturally, the media isn’t interested. UPDATE 8:52 PM GMT (4:52PM EST) Wikileaks confirms only that Julian Assange’s Internet was disconnected. Julian Assange has been without access to the Internet for 28 hours. 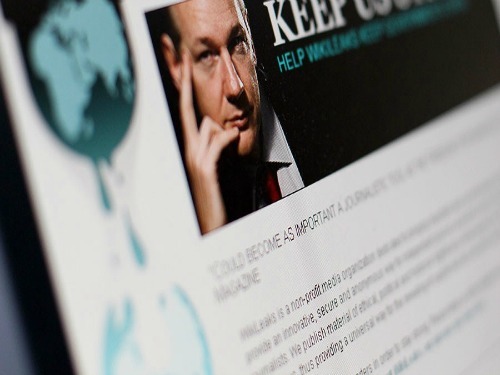 UPDATE 4:54PM GMT (12:54PM EST) Information circulating that suggests there are more members of @Wikileaks impacted. Not just Assange at the Embassy. Wikileaks has someone still posting. UPDATE 3:59PM GMT (11:59AM EST) It appears Wikileaks has signalled all operatives to take measures to protect themselves. Guccifer 2.0 has indicated he is ready for the next release. Looks like Podesta 10 is still coming, but possibly just late. UPDATE 3:35PM GMT (11:35AM EST): Wikileaks has missed its own deadline to post next release of Podesta Emails. London Police still refuse to comment, Embassy still refuses to confirm if Julian Assange is on the property. Wikileaks Communications channels are completely silent. Wikileaks Website is still intermittent, reason unknown. UPDATE 2:44PM GMT (10:44PM EST): Associated Press reports Embassy refuses to confirm Assange is still on the property. Local London Police refuse to comment. From time to time Wikileaks creates what are called “Insurance Files”. These files are released into the wild using a Torrent. A Torrent is a distributed file sharing technology that allows the downloader to become the host. It is a way to get data out without sending it from a central source. It is impossible for any government to stop a Torrent without severely restricting every citizen in the effort. Through the entire history of Wikileaks, Julian Assange has never released the keys to decrypt an Insurance file, until now. As the community wonders what Wikileaks means by its posts, information warriors have already decrypted and analyzed portions of the 88GB Insurance File. Folks! Based on our early analysis, John Kerry is likely going to prison. About eight hours before this article was written Wikileaks released three separate keys for an Insurance File. It is believed by the community of Wikileaks insiders that this was the result of a “Dead Man Switch”. This is an action that Julian Assange must take periodically to prevent an automatic tweet which releases information. We have no information to substantiate these rumors. This means that not only is Wikileaks releasing a portion of the 88 Gigabytes of data, they are releasing it without placing it on their website. Wikileaks called the Tweets “pre-commitments”. It is interesting that the three “pre-commitment” keys released are concerning the UK, Ecuador, and John Kerry. All of which are parties involved in Julian Assange’s current situation at the Ecuadorian Embassy in London. The following phone call was recorded two hours before the reports of a possible raid on the Embassy. The person who shared it has restricted the ability to share it here is the link. Reddit has created a Mega Thread regarding these claims, which occurred AFTER the Julian Assange proof of life video. No English based news agencies have reported on the most recent development related to the Swedish Arrest Warrant. Roger Stone Tweeted a few minutes later after the above Tweet was posted. This could be related to negotiations between those parties and the freedom on Julian Assange. Also, John Kerry recently threatened Ecuador if they did not silence Assange. It appears there is something more going on, but currently, no one is talking. We are analyzing the keys provided in the Tweets against the Insurance Files. As we know more we will make as much information about this as we can available, without jeopardizing anyone’s safety. We are not sure if this is related to the keys for the Insurance Files or not. We will update you as soon as we know more. Normally we would link to the Tweets, however, due to the nature of the current situation we have provided images of those Tweets. We can only confirm that Julian Assange has only been disconnected from the Internet. Finally, our technical experts have asked us to add a clarification. There are a lot of people claiming that these are not keys, but instead only the hash of the plain text. They clearly do not understand Encryption. A hash is used to validate the authenticity of the sender against the sender’s public key in a PKI infrastructure. These files were not encrypted using PKI, they were encrypted using multi-key overlays, with multiple keys per file section. In other words, these Hex Keys decrypt the portion of the files that include information about the subject mentioned in the Tweets. Youtube Video showing caller attempting to determine if Assange is still at the Embassy and if he is still alive: “I am sorry I can’t talk about that.” was the response he received. If this website or this post disappears, without an explanation from us, you will know that we were forced to take it down by authorities. The organization first announced the activation of “appropriate contingency plans” in a tweet early Monday morning after Assange’s internet was reportedly cut off. The announcement came hours after WikiLeaks published three cryptic tweets Sunday afternoon referencing Ecuador, U.S. Secretary of State John Kerry and the United Kingdom’s Foreign and Commonwealth Office. Each tweet was accompanied by a string of jumbled numbers and letters. Assange is currently residing in the Ecuadorian embassy in London, England, where he has remained since seeking political asylum in June 2012. Kerry is currently in London as well for meetings with British, French and German foreign ministers regarding peace brokering attempts in Syria. Over the last week and a half, WikiLeaks has steadily released thousands of emails from Clinton campaign manager John Podesta’s Gmail account. WikiLeaks previously released hacked emails from the Democratic National Committee that showed party officials colluding against Vermont Sen. Bernie Sanders. So, is it a coincidence that SecState John Kerry is currently in London — where Assange is residing in the Ecuadorian embassy seeking political asylum — when suddenly the Ecuadorian government cuts off Assange’s internet? Could this be an example of the Obama administration exerting international force for once? Shocking in and of itself, if true. Unfortunately, if indeed this is the case, it would appear to be doing so to protect its own interests — protecting itself and its chosen heir from being further exposed to the American people — rather than the interests of the American people it is supposed to be serving. So very telling. The United States government silencing its political enemies? So very chilling. And only makes one wonder even more: what are they so hellbent on hiding from us? While it is unclear if it was done on purpose or by mistake, moments ago a folder within the Wikileaks server has opened at the addresshttps://file.wikileaks.org/file/ which provides a glimpse into thousands of doc, pdf, wav, jpg and various other files, as well as dozens of subdirectories including Videos, Syria-files, Collateral Murder, Japan Bribery Affair, and many others.